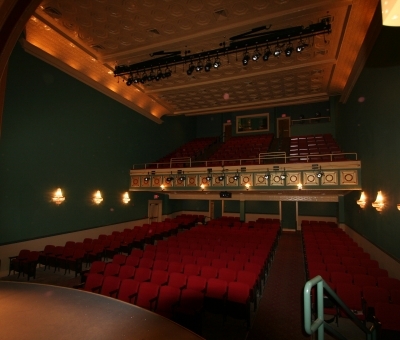 Colonial Theatre - Productions Unlimited, Inc. | Productions Unlimited, Inc. 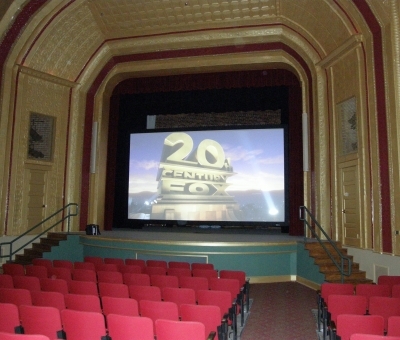 The Colonial Theatre stands at the apex of South Hill, Virginia’s downtown business district. 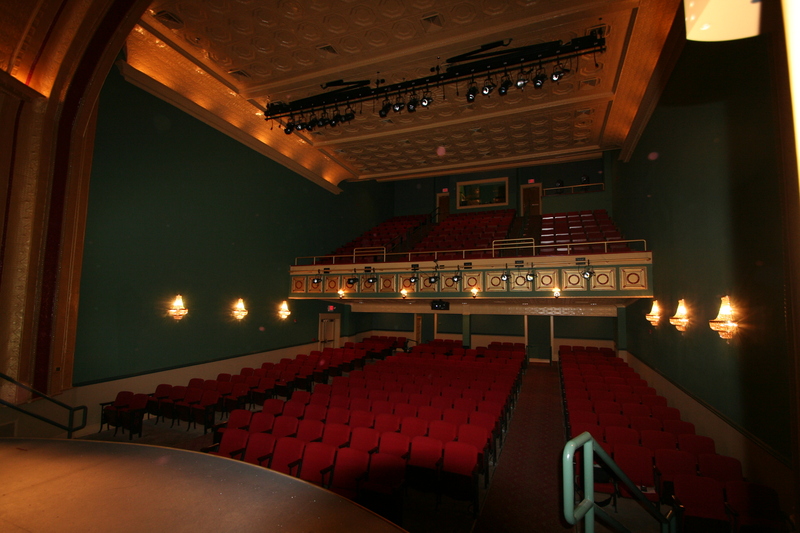 The building is part of the town’s revitalization project, an admirable endeavor to keep the town’s rich history alive. 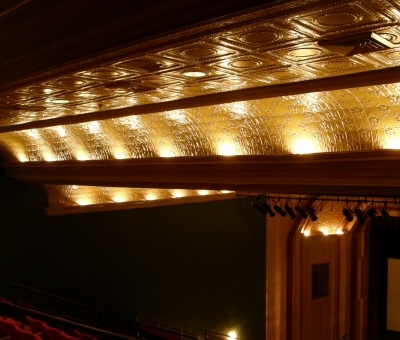 With few exceptions, the theatre’s exterior remains aesthetically akin to its original 1925 design. 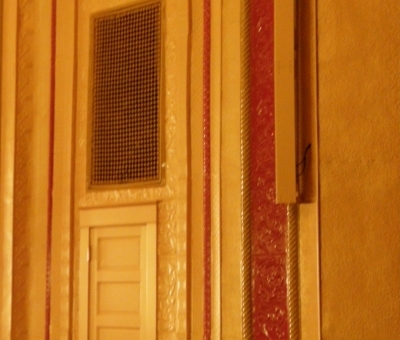 Likewise, the restoration of the interior has left the authentic design and materials largely intact. 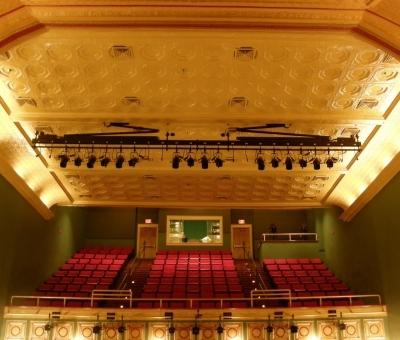 The task given to Productions Unlimited, Inc. was to outfit this remarkable revitalization with state-of-the-art theatrical equipment to make for a truly unique combination of history and modernity. 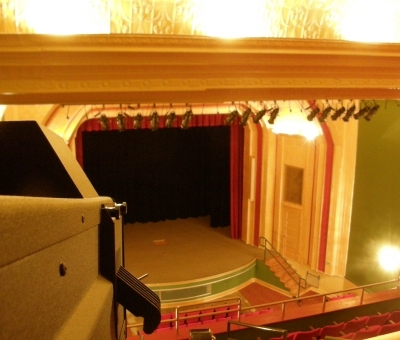 Our work began with one of the first installations of an ETC Prodigy hoist system over the stage and house, allowing users to raise and lower heavy loads of scenery, lights, and curtains with relative ease. The next step was installation of lighting and audio/video systems. 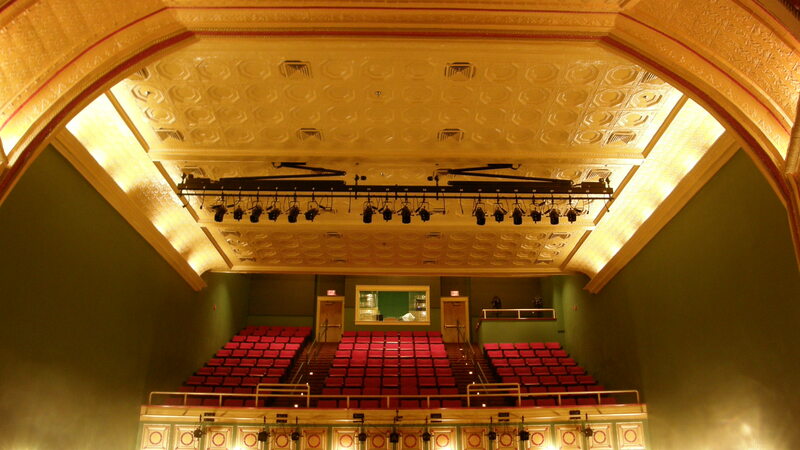 A fixture package of ETC Source Four fixtures, work lights and broad cycs from Lighting & Electronics, and a StarkLite followspot from Lycian are the primary ingredients of the lighting system in Colonial Theatre. An ETC Element console works in concert with ETC Unison Paradigm dimming to create elegant lighting designs with maximum control. 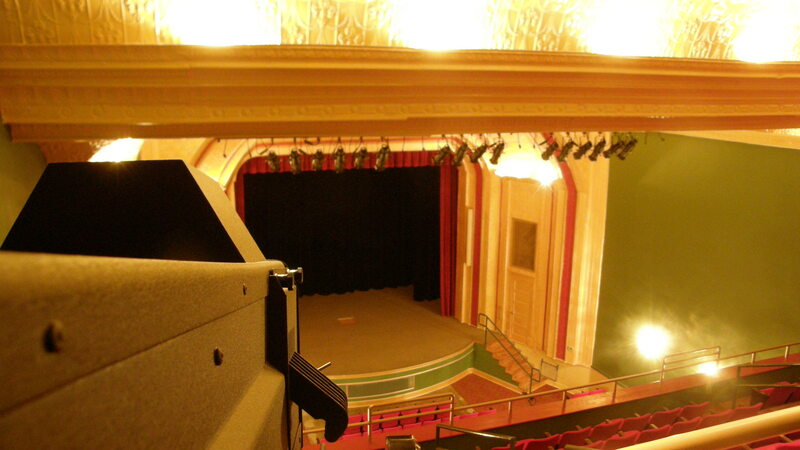 A company switch, manufactured by SSRC, completes the system, providing a convenient and reliable electrical source for large road shows visiting the theatre. 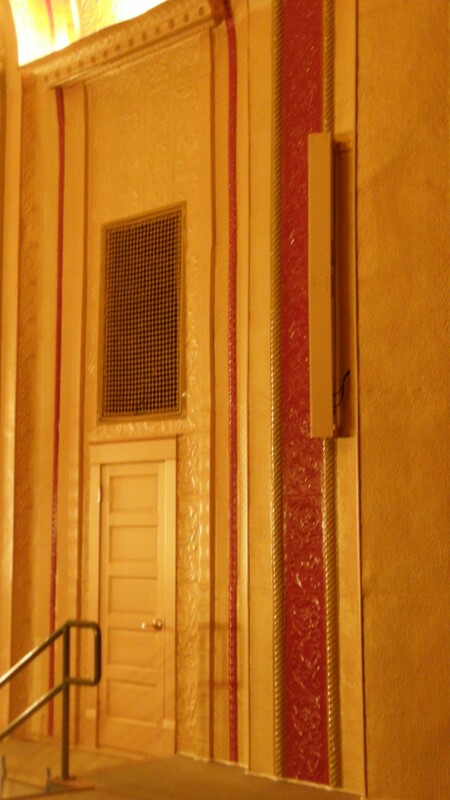 The centerpieces of the sound system in Colonial Theatre are Renkus-Heinz line array speakers, chosen for their architectural transparency. 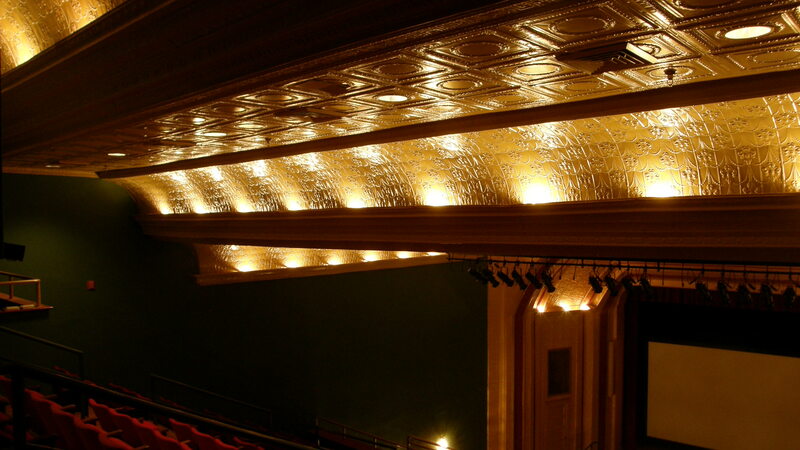 Custom gold paint and tall, slender enclosures allow these speakers to blend seamlessly into the ornamental pressed tin decorating the proscenium, thus maintaining the theatre’s historical appearance without compromising sound quality. Sound processing is controlled by two BSS Audio digital signal processors, while mixing capability is provided by a Yamaha 01V96 digital console. We also provided an Assisted Listening System by Listen Technologies and installed a Clear-Com intercom system, as well as a switcher by Analog Way. 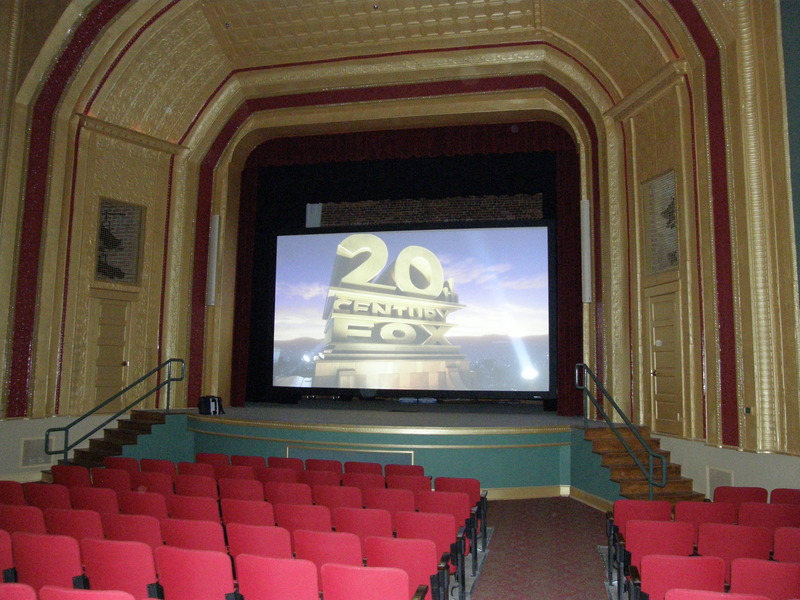 The video system’s keystone is a Digital Projection TITAN 1080p-500 projector, capable of displaying bright, high-contrast images with astonishing resolution and clarity. The screen, a Da-Lite Fast Fold, affords users a choice between setting up onstage or attaching the screen to the Prodigy hoist system. 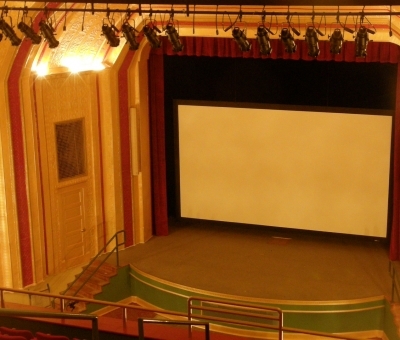 This top-of-the-line video system allows Colonial Theatre to carry its patrons back to the days of Friday night “tin can movies” with the nostalgia of a different time, but the quality of modern technology. 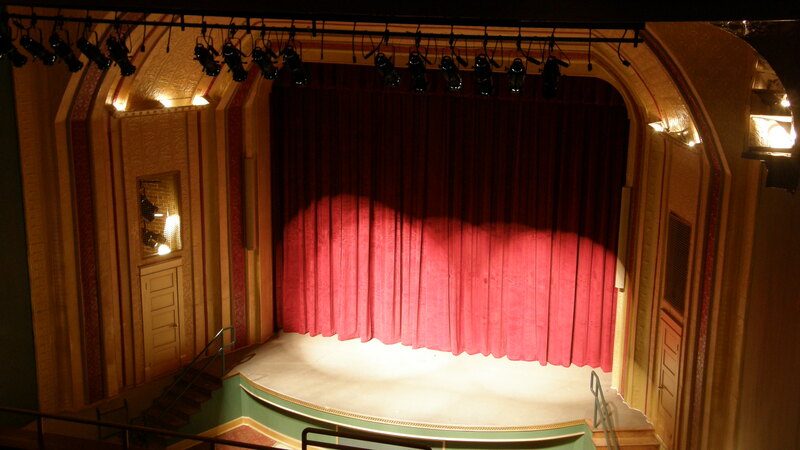 The final step of our work at Colonial Theatre was the installation of classic red velour stage curtains, manufactured by Stage Decoration and Supplies. 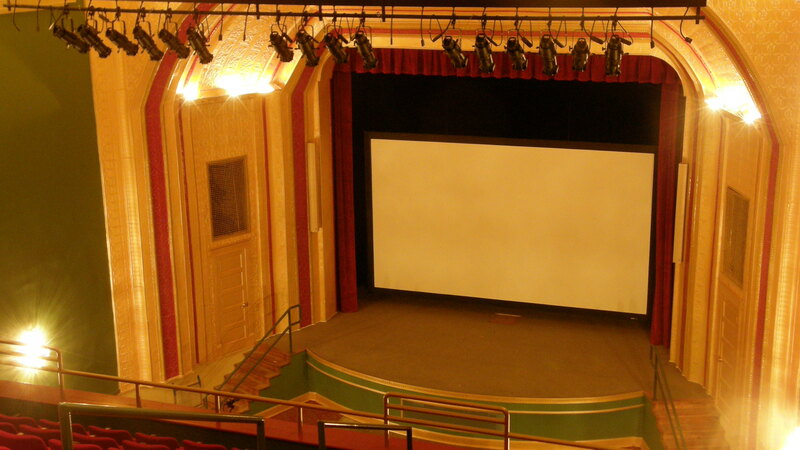 The curtains are a perfect complement to the theatre’s gilded proscenium. 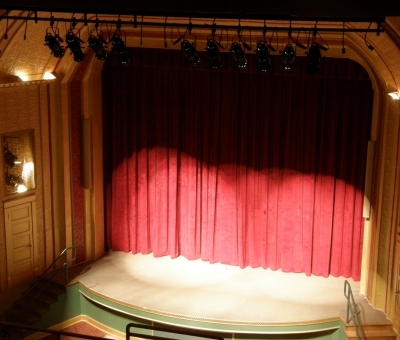 Productions Unlimited, Inc. is proud to have had a hand in the revitalization of South Hill’s historic theatre!